Firstly, I wish to thank President Ahmet Guleç for having invited me to attend and contribute to this important Convention. I have still in my memory the honour I have had to speak at the MOSFED Gala Dinner, on 29th January 2015. To-day, since I am not an expert, nor a Professor as Prof. Dr. Kerem Alkin design, I will transfer you some pieces of my experience as an interior design entrepreneur. I will touch four subjects. 1. Why and how the Italian Design was born. 2. How, in my opinion, the Turkish furniture my consolidate the already existing positive trend in export 3. How you, furniture manufacturers, could approach the Design Education 4. A glance to innovation in materials and manufacturing process. 1. The Italian design was born because we have lost the Second World War. In the 1944, before starting the reconstruction, Italy was a semi-destroyed country and people only wanted to forget the recent past. It happened the contemporary presence of three factors: a) the desire of Italians for the new, b) some smart entrepreneurs who had understood the existence of a potential market for new products, c) talented architects, who, being lacking the capitals to accomplish new buildings, began to focus on the design of objects. Moreover, the several invasions suffered throughout the course of centuries, had made Italy a multicultural and multiracial country, and is also for this reason that the Italian design “spoke” different language and, as well as PIZZA, was accepted everywhere, in every market. In Italy, as in Turkey, not all the products of the furniture sector embody design values, but certainly the companies design oriented are responsible to build the Turkish furniture brand in the international market, and to act as a bridgehead . One of the strategies to strenghten such a trend is to offer to the international market products embodying competitive advantages. May I suggest how to create these advantages, basing myself on some Italian experiences ? And the Italian experience may be useful to you, because I feel here in Turkey the almost same atmosphere of a remarkable potential and energy that we enjoyed in Italy many years ago. b)	the Public Administration, namely the Ministry of Industry and Foreign Commerce should help: you, and not I know how this public support should be implemented. As far as the growth of the Italian Furniture export regards, it started his increase in 2000, when, in my role of President of FederlegnoArredo, I was able to convince the Foreign Commerce Minister – at that time there was a special Ministry, to-day this Ministry is part of the Ministry of Industry, and the promotion of Italian products is implemented by the Italian Trade Commission – that any public institution had to seriously have the Association of the specific Sector participate to the definition of the politics and strategies. Minister Piero Fassino accepted my suggestion, and convoked the ABITARE ITALIA TABLE, and FederlegnoArredo had the real leadership of any promotional event. As an example, during the New York Furniture Fair, hosted at Jacob Javits Convention Center, we organized touring exhibitions, with 20 minibus stopping for half an hour across the about 15 show-rooms showing Italian furniture, where an Italian designer was ready to explain the product he or she designed, on display there. The result was good: the exportation in USA almost doubled in 5 years. 3. You have to establish a strong cooperation with the Design Universities, to obtai that the education they give to design students is consistent with the competences and motivations of the designers whom you, as manufacturers, need and want to be successful in foreign markets. In Italy, as in Turkey, not all the products of the furniture sector embody design values, but certainly the companies design oriented contribute to build the Turkish furniture brand in the international market, and to act as a bridgehead for the whole furniture sector . When I was the Dean of a closed number public Design University in Florence – ISIA, whose historical name was Istituto Superiore Industrie Artistiche – I have established the Filiera del Progetto, the Project Draw-plate, by creating an organic connection among manufacturers, design professors and students, by inviting some manufacturers to explain to the professors and the students, how he used to work with his company’s designer to develop a new product. May I suggest that you demand to Professors that they should help and even stimulate the designers graduated in their Faculties to design Turkish furniture, which means pieces of furniture having shapes and made with materials distilled from the roots of the – am I allowed ? - Ottoman visual culture, and possible made by Turkish materials, both giving a visible identity to the Turkish furniture, so reinforcing the Turkish furniture brand ? 4. I understand that also here in Turkey there is a growing attention to innovation in materials and manufacturing processes. 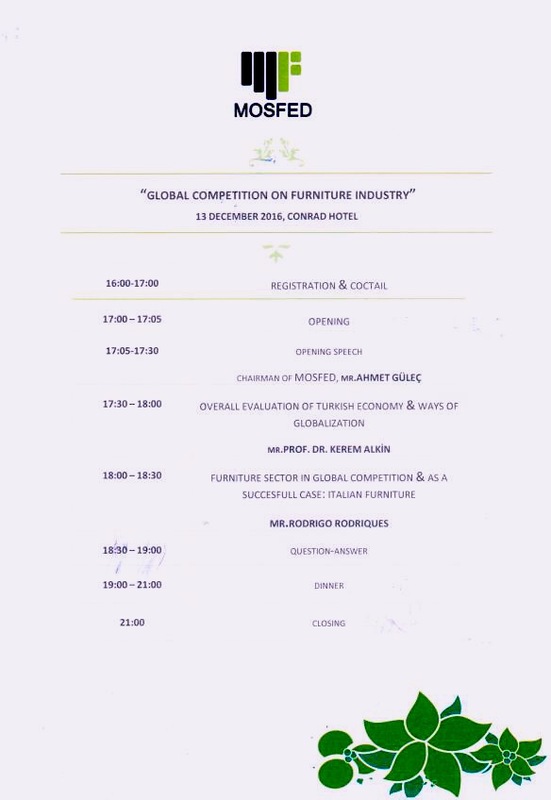 Since I am, at present, devoting part of my time and attention to Material Connexion Italia, a licensee of Material Connexion New York, I wish to convey you the growing importance that innovative materials have in the production of durable consumer goods, including furniture. The mission of my company is to forge links between the suppliers of innovative materials and processes and the users, both designers and architects,, thereby offering permanent access to new materials and new ways of using existing materials, with a particular emphasis on sustainable materials. So doing we contributes to the efforts that small and medium-sized furniture manufacturers make to master innovation. Now, I will show same slides taken from a research that our experts have done to Italian client in the interior decoration sectors. While speaking about innovation, I can not mention, without entering in such an important subject, factory 4.0, the new frontier of the industrial progress, which will allow all the production lines to speak each other, also in connection with the other ring of the system.